Hand-hewn log cabin on Four Mile Creek. In-town location but on a 5 acre horse farm. Two- story 800 square foot cabin. First floor has full kitchen, small dining table, couch which is a double-sized sleeper and bathroom with stall shower. Couch sleeper not comfortable for adults but would work for children. Second story has a queen bed, large dresser and washer and dryer area. The stairs to the second floor are STEEP and NOT good for folks with bad knees or hips. Dogs are allowed but they cannot get up or down the stairs. There is a fenced area for dogs on the creek side of the cabin. There is not central heat but there is a Propane heater on first floor and electric heater on second level. These keep the cabin toasty warm in the winter. Summertime there is a large floor air conditioner. Cabin was built by the owners who are semi-retired home builders. As this cabin is located on a creek there is the opportunity to see various species of birds, deer, elk, fox and occasionally a bear! Two seats at counter and two chairs at small dining table. Perfect little cabin by the creek! Super clean, perfectly accommodated and 5 min from everything. Myself, wife and daughter stayed here for three nights and it was perfect. It is located on a horse farm with 5 horses that are very friendly and love to eat carrots. Canon City is worth the visit. We took the train and went to the Gorge state park...the gondola scared the crap out of me! LOL! If you do decide to get to Canon City I would highly recommend three things. 1) If you are a smaller group, stay at this cabin. 2) Go to the Gorge. 3) Eat at the French Bakery, some of the best pastries I have had in a very long time. (owner is French and knows what he is doing). Only thing to mind is the staircase, owner is not kidding when they say if you are elderly or have bad knees this may not be the spot for you. 5 out of 5!! Very comfy, cute cabin, we enjoyed our stay. It was such a nice little cabin to go relax and get away. We really enjoyed our stay and would definitely go back. It was close enough to town that you could go eat or shop but you still felt as though you were out in nature. Beautiful cabin and property for a short weekend getaway. The cabin was well appointed, bed was comfy, and the side yard was awesome for the dogs. Would love to stay again! The perfect place for a weekend getaway. We really enjoyed our stay. The property is beautiful and the cabin is warm and cozy and was perfect for our weekend getaway. Beautiful, Quiet, and Relaxing Cabin! We loved staying at the Creekside Log Cabin! Susie was very welcoming and had thought of everything we may need. The cabin itself was beautifully decorated and warm (even though there was a major cold snap outside). We enjoyed watching the horses on the property, and my dog loved running around the fenced area. It is definitely true that a dog is unable to get up the stairs to the bedroom, but downstairs is cozy too. 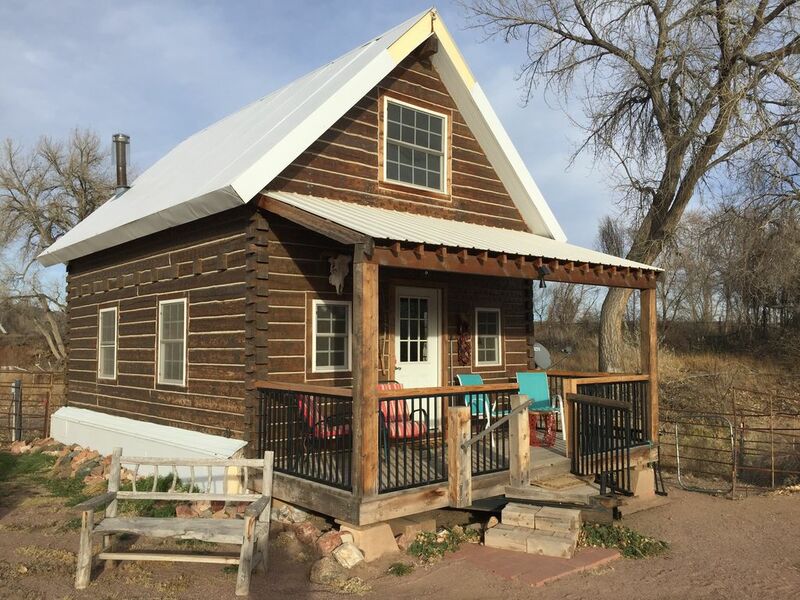 The cabin is right off of the creek and right outside of town, so you can make it to town easily and enjoy some peacefulness at the cabin. Overall we had a great stay! World class rock climbing and white water rafting! Newly rebuilt Royal Gorge Park. Exceptional Dinosaur Museum. Mountain biking, hiking, horseback riding.